On all reroofs without positive slope to drain and all protected or modified protected membrane roofing, only non-organic felts or membranes may be used. A minimum slope of 1:50 (l/4" in 12") is strongly recommended (NOTE: positive slope to drain is required for a RoofStar 5-Year Roofing Guarantee or RoofStar 10-Year Roofing Guarantee for new construction), but positive slope to drain is an absolute requirement for organic felts. Positive slope to drain is attained when no standing water remains on the deck within a reasonable amount of time after rainfall stops during days with conditions that permit evaporation. Drain wells that are designed to collect water and provide a flat surface for the installation of roof drains do not require slope. Therefore standing water may remain in drain wells for a longer period after a rainfall stops. Slope can be provided by sloping the deck, or using tapered insulation boards of insulating fill (insulating fill is rarely used in B.C.). One of the major concerns when applying modified bituminous membranes with hot asphalt is to ensure the asphalt remains hot enough to fuse with the binder of the membrane. The asphalt temperature must conform to the membrane manufacturer's minimum application temperature and minimum +205°C (+400°F) as required by RoofStar Guarantee Standards (see also 9.2.1 Bitumen (Asphalt) Requirements). Asphalt should not be mopped more than 1 m (3') preceding the roll as it has been demonstrated that the temperature of mopped asphalt drops sharply once mopped out (read more in Built-up Roofing (BUR) Materials). In addition to asphalt temperature, particular attention should be paid to slope limitations, fastening requirements, type of asphalt, the amount of asphalt used, and membrane flashing requirements when using hot asphalt. Some manufacturers may require "torched" membrane flashing to ensure a proper bond and prevent problems with slippage or asphalt running down the vertical and collecting at the cant. Slippage can also be a problem when an excessive amount of asphalt is used. Only enough asphalt to meet the adhesive requirements is needed. The mopping asphalt has a lower softening point than the bitumen in the membrane and may result in asphalt running and slippage problems. The design authority should recognize that the appearance of wrinkling and ridging in modified bitumen cap sheets applied in hot asphalt may be generic to certain manufacturers of this system, and particularly when attempted in cooler temperatures. Although some manufacturers' literature suggests application may take place in temperatures as low as -25°C (-13°F), there are many subsequent limitations, the variables of which may result occasionally in severe wrinkling or ridging of the cap sheet as well as potentially poor adhesion. The RoofStar Guarantee Program recommends that, in order to minimize the potential for wrinkling and ridging, the use of mopped cap sheets not be considered or specified when ambient temperatures (including wind chill) may go below +5°C (+41°F). The quality of the binder (waterproofing agent). The choice of carrier including suppliers of fibreglass, polyester, or a combination of the two. Engineering of the sheet (composition and placement of the components within the sheet). Quality control of the manufacturer. Expertise of the manufacturer's personnel (including field representation). Recommendations as to what is required for a completed system and the recommended application procedure. Installation in the field by a competent contractor. The designer's role in choosing the product(s) which satisfy each previous item described. The wrinkles or ridges are usually considered an aesthetic problem only, but may occasionally result in fishmouthing and intermittent bonding of the cap sheet. Both of these deficiencies affect the performance of the membrane. The RoofStar Guarantee Program recommends the use of torch applied thermofusible cap sheets in 2-ply modified bitumen systems in all cases, but particularly if roofing must be carried out in cool or cold weather. Appropriate safety precautions regarding torching must be addressed. NOTE: Occasionally some mopped systems, particularly with heavy cap sheets, have exhibited a propensity for membrane slippage, frequently on insulated systems where there is a combination of slope, heavy inter-ply mopping and lack of mechanical fastening (back nailing) of sheets. See 8.3.4 "Mechanically Attached" membranes for requirements and slope limitations. It is also common for mopped systems to exhibit some asphalt bleed-out at the seams. Minimal or reasonable bleed-out is to be expected and is an aesthetic problem which may be minimized by the embedment of matching granules. Bleed-out which oxidizes and alligators with time does not normally affect the waterproofing efficiency of the roof. Roofing is to be completed from deck to gravel coat in one operation. An adequate asphalt glaze coat is acceptable temporary surfacing on a completed membrane assembly. Adequate is defined as enough asphalt to prevent moisture absorption in the felts. Note: All layers of felt must be applied the same day. Retrofitting over existing membrane is permitted only in specific circumstances and only when approved in writing by the RoofStar Guarantee Program (Technical Manager) and the membrane manufacturer. All wood decks shall be properly fastened to BC Building Code requirements. With the exception of standard insulated roof systems, all knots or cracks shall be covered with metal prior to acceptance of deck surface.This work is to be done by others. Non-veneer (O.S.B. or wafer board) panels are acceptable sheathing for decks with low-slope roofing applications, provided the roofing membrane is not fully adhered directly to the panels. The minimum plywood or non-veneer (O.S.B or wafer board) deck thickness for low-slope roofing (i.e., membrane roofing) shall be a minimum 12.7 mm (½") and as indicated in the applicable Building Code. Primary roof membranes fully adhered to wood decks is not permitted. Wood board decks, especially mill decks, often have so many surface defects that a plywood overlay is desirable (9.5 mm (⅜") plywood is often acceptable). A plywood overlay is required for asphalt shingle roofs. Where a plywood overlay is not required, a mechanically fastened base sheet or separator sheet is required for built-up roofs or fully-adhered bituminous or modified bituminous flexible roofing membranes. For non-bituminous flexible membranes (elastomeric or plastomeric membranes such as EPDM or PVC), a slip sheet or separator sheet should be installed according to membrane manufacturer's recommendations. Separation sheets, slip sheets, and mechanically fastened base sheets are installed to help relieve stresses in the membrane due to movement of the deck. Non-veneer (O.S.B. or waferboard) panels are acceptable decks on low-slope roofing applications when an approved separation sheet or rigid insulation is mechanically attached before roofing is applied. Where specifications call for mopping directly to concrete, the deck shall be primed. When using asphalt as the adhesive, insulation must be solid-mopped to primed concrete or to solid-mopped vapour retarder or vented base sheet. A roof divider is usually designed as two raised wood members attached to a wood base-plate that is securely anchored to the roof deck and then properly flashed with membrane and metal.. Roof dividers should divide the roof into approximately equal, regularly-shaped areas. Ideally, roof dividers should be located at the high points of the roof, with drainage away from the divider on both sides, but DRAINAGE MUST NOT BE IMPEDED BY THE ROOF DIVIDER. the CSA A123.21 Standard Test Method for Wind Uplift Resistance does not always apply to BUR Roof Systems; traditional felt and bitumen assemblies have not been included in the test methods and tested assemblies subject to the CSA Standard. Consult the requirements when designing, specifying or constructing a BUR Roof System using SBS Modified Bituminous membranes. For other RoofStar Guarantee Standards applicable to wind uplift resistance, see below under INSULATION. NOTE: The requirements set out below must be interpreted in conjunction with complete RoofStar Guarantee Standards for Low Slope Roof Assemblies. Refer to Modified Bitumen Roof Assemblies, EPDM (Thermoset Membranes) Roof Assemblies, TPO/PVC Roof Assemblies or BUR (Built-up) Roof Assemblies for relevant RoofStar Guarantee Standards. To qualify for a RoofStar Guarantee, and to comply with the RoofStar Guarantee Standards in this Manual, mechanically attached and adhered insulated membrane systems must be secured to the roof deck in keeping with the requirements set out below. 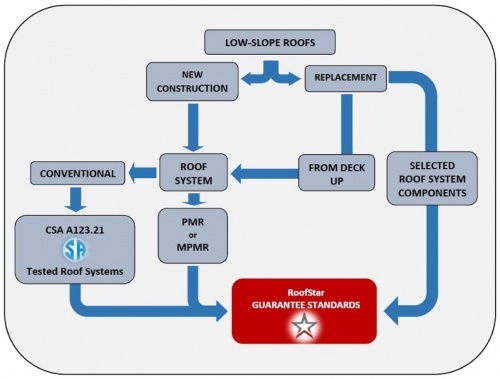 To qualify for a RoofStar Guarantee, and to comply with the RoofStar Guarantee Standards set out herein, all new Membrane Roof Systems that begin with an exposed deck (MARS, PARS and AARS) must be designed and built to meet or exceed the test requirements of the CSA Standard (NOTE: this applies to projects bid after either April 1, 2017 or the issuance of the British Columbia Building Code, 2017 Edition, whichever comes first). Only those Membrane Roof Systems that have successfully met the CSA Standard through tests administered by a qualified test facility/laboratory will qualify as an Accepted Membrane Roof System Assembly for a RoofStar Guarantee (see exceptions noted below). Click here for a list of qualified testing facilities. When an existing roof system is removed to expose the deck, the replacement roof is considered new and therefore the design and construction of the replacement roof assembly must meet or exceed the minimum requirements set out by the CSA Standard. Furthermore, a replacement roof must conform to existing BC Building Code requirements for performance. For reference, see the BC Building Code (latest edition), Div. A, Part 1, Section 1.1 General (cf. 1.1.1.1. Application of this Code, and 1.1.1.2. Application to Existing Buildings). 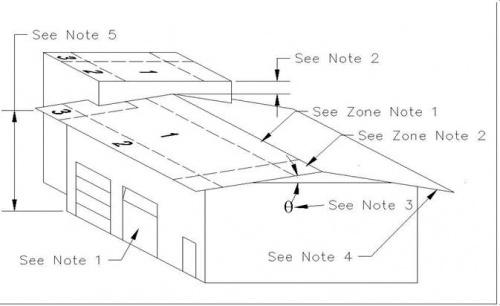 When a Membrane Roof System incorporates materials that are not part of the RoofStar Guarantee Program, appropriate substitutions for those materials shall be made from the list of RoofStar-accepted Materials, and test data extrapolated in keeping with ANSI/SPRI WD-1, “Wind Design Standard Practice for Roofing Assemblies” (cf. National Building Code of Canada 2015, A-5.2.2.2. (4) Membrane Roofing Systems). The Design Authority, or in their absence, a Member, shall be responsible for the selection of appropriate material substitutions. When only a part of a roof system is replaced, in which the roof deck is not exposed, the CSA Standard does not apply. Nevertheless, partial roof replacements shall still conform to all other RoofStar Guarantee requirements for roof system assembly set out in this Manual. Also refer to ANSI/SPRI WD-1, “Wind Design Standard Practice for Roofing Assemblies” (cf. National Building Code of Canada 2015, A-5.2.2.2. (4) Membrane Roofing Systems) and the Wind-RCI calculator. All components utilized in a partial roof replacement shall still be selected from the Accepted Materials section of this Manual. See the 'decision tree' illustration below in conjunction with these requirements and guidelines. The roof area is divided into three areas (zones). The perimeter area is defined as 10% of the building width or 40% of the building height, whichever is less. In no case will perimeter area be less than 2.0 m (7'). The field area is defined as the remaining area after the perimeter is calculated. less than 18 m (60’) and pitched (slope is greater than 2:12). Perimeter fastening along the entire eave will be enhanced to corner requirements. The corner area is defined by the perimeter in both directions at the corners. In no case will the corner area be less than 2.0 m x 2.0 m (7’ x7’). For corner enhancement of roofs in high wind locations (higher than 100 mph) or for roofs above 60’. Zone 2. The area at the edge of the roof. Perimeter width shall be defined as the lesser of 10% of the building width or 40% of the building height, but not less than 2.0 m (7’). Zone 3. Corner area dimensions shall be equal to perimeter width in both directions and not less than 2.0 m (7’). Contribute to increased wind uplift on roof area. Included in RoofStar Guarantee Standards fastener requirements. Where less than 900 mm (3’), design as if one roof. Where 900 mm (3’) or greater, upper roof should be designed as separate roof. Wind uplift changes at all Zones as slope changes. Overhangs increase the wind uplift in some roof locations. Included in RoofStar Guarantee Standards fastener requirements. On slopes under 10° (2’ in 12’ nominal) use eave height for roof height. On slopes 10° (2’ in 12’ nominal) or greater, use mean average roof height (mid-point). On slopes over 10° (1:6 or 2" in 12", nominal) the ridge field area should be upgraded to Zone 2 (perimeter). On slopes over 10° (1:6 or 2" in 12", nominal) and on buildings 18 m (60’) high or less ridge perimeter at the corners should be upgraded to Zone 3 (corner). 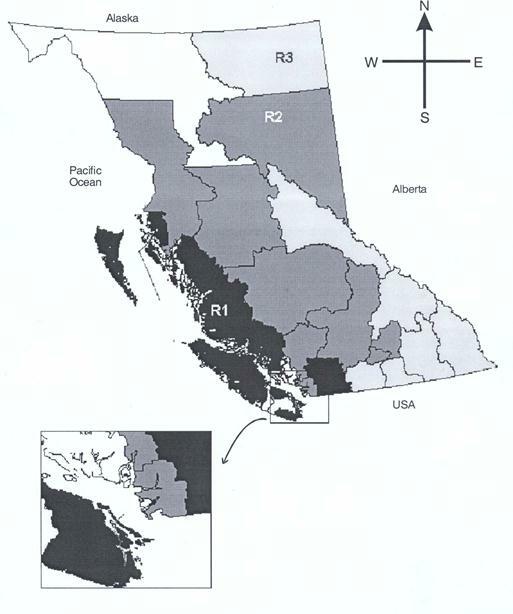 Region 1 is located near the coast while most of Region 3 is located at the inland area. All BUR roofing membranes should be constructed of products supplied by the same manufacturer. Acceptable base sheets are composed of either a fibreglass or organic felt core that has been saturated and coated on both sides with bitumen. Fibreglass felt asphalt-coated base sheets must be used in conjunction with glass-ply felt (Type IV and VI) and polyester felt built-up roofs. For more information about BUR materials, see BUR Materials in the Essential Elements section of this Manual. Gypsum boards on vertical surfaces must be a RoofStar-accepted overlay boards with water resistant properties. On steel framed walls, it is acceptable to use gypsum overlay boards accepted for the RoofStar Guarantee Program, provided the gypsum board has a minimum thickness of 12 mm (½") or fibre-mat reinforced cement boards with a minimum thickness of 9.5 mm (⅜") that conform to ASTM C1325-04. Pre-cast panels, post-stressed beams, or “T” and cavity decks must have a separation layer such as fibreboard, gypsum board, plywood, proprietary overlay board etc. applied over the deck prior to the application of the roof membrane. Where a difference exists in the levels of adjacent surfaces, the general contractor or others shall install grouting. This grouting shall be feathered on the lower surface a minimum distance of twelve times the amount of the vertical differential. 1. When a membrane is specified for application directly over a steel deck, the RoofStar Guarantee Standards require a steel deck overlay of gypsum with fibreglass facers and a silicone treated gypsum core (see min. standards below), or plywood having a minimum thickness of 12.7 mm (½"). Where an underlay is used as a thermal barrier, it must conform to the applicable code and insurance requirements for the roof assembly and be fully supported by the deck. 2. Gypsum boards installed over steel decks as substrates for primary roof membranes must be a minimum thickness of 12.7 mm (½") RoofStar-accepted overlay boards. All edges of the gypsum board are to be fully or intermittently supported by the deck and end joints to be staggered (offset) 300 mm (12") from adjacent board rows. A minus offset tolerance of 50 mm (2") maximum will be permitted to compensate for variance in the manufacturer's tolerance of differing board widths and lengths. 3. When gypsum board is required on steel decks as a substrate overlay, the gypsum board can be fully mechanically fastened to the deck or adhered with proprietary polyurethane foam adhesives acceptable to the primary roof system manufacturer. Attachment must meet or exceed the CSA A123.21-14 requirements for the building dimensions and geographical location. 4. When gypsum board is used under mechanically fastened insulation, the gypsum board must be fastened independently from the insulation. The minimum number of fasteners(screws or screws and plate) is four (4) per sheet. When applicable, adhesive systems must meet or exceed the CSA A123.21 requirements (current edition) for the building dimensions and geographical location. 1. An RoofStar-approved separation sheet, minimum 40-lb asphalt coated fibre glass base sheet conforming to CAN/ CSA A123.16 - M88 (R1996), Type II or manufacturer’s accepted base sheet of equal or greater weight and reinforcement, or RoofStar-accepted rigid insulation / overlay board mechanically attached or semi-adhered membrane (spot or strips) is required over non-veneer panels before fully adhered roofing membrane is applied. 3. Fully adhering modified bituminous membranes directly to wood decks is not permitted. Where permitted by the Building Code, all concrete or masonry parapets or walls to which roofing is to be applied must be sheathed with minimum 15.9 mm (5/8") plywood or 9.5 mm (3/8") reinforced cement board that conforms to ASTM C1325-04 solidly attached to the roof deck with adequately treated blocking. Compressible insulation is to be installed between the sheathing and the wall. Coping and / or counter flashing is to be installed. See Detail: D1.7.4 for an illustration. The plywood is to extend either a minimum of 200 mm (8") above membrane surfacing or, if required by the type of membrane, to the full height of the parapet or wall. This item is supplied and installed by others unless specified otherwise. Gypsum boards on vertical surfaces must be RoofStar-accepted overlay boards with water resistant properties. On steel framed walls accepted gypsum overlay boards with a minimum thickness of 12mm (1/2") or fibre-mat reinforced cement boards with a minimum thickness of 9.5 mm (3/8") that conform to ASTM C1325-04 are an acceptable vertical substrate to receive roofing. See also Storage and Handling notes under the Polyisocyanurate section of Insulating the Roof, in this Manual. Fastener requirements are not the same for all deck materials. As plywood thickness and steel gauge increases, fastener pull-out strength increases, hence fewer fasteners are required. In the case of heat insensitive insulation, one layer of acceptable overlay board is required. For hot asphalt applied roof assemblies the insulation is to be mechanically fastened before an acceptable overlay board is fully mopped to the insulation. Alternatively, manufacturers' proprietary insulation adhesives may be used to adhere accepted overlay boards to insulation. When hot asphalt or adhesives are not used in a roof assembly accepted insulation and overlay board(s) may, as a group, be mechanically fastened directly to nailable decks including steel. When applicable, proprietary adhesive applied insulation/overlay board membrane systems accepted and installed in the RoofStar Guarantee Program shall conform to the CSA A123.2 Standard test method (latest edition) for the dynamic wind uplift resistance of adhesive attached membrane roofing systems. NOTE: See more information on Insulation Overlay Boards Essential Elements. RoofStar-accepted insulation overlay boards shall be installed over all plastic foam insulations (EPS, XEPS, Polyisocyanurate) on all adhered low slope roofing systems. When heat sensitive insulations (EPS,XEPS) are used with heat welded membrane seams an accepted overlay board must be installed. Fibreboard shall not be used with flame welded seams. A. Single layer system: When insulation is installed as a single layer, flame protection over the cover board is required. Install the insulation and cover board with the proprietary accepted adhesive. Seal over all board joints and wall transitions with membrane manufacturer's approved self-adhered membrane tape. As an alternative to the use of hot bitumen, the membrane manufacturer's proprietary insulation adhesives may be used to adhere accepted cover boards and insulation. RoofStar-accepted mechanically attached asphalt core overlay boards [minimum thickness 4.5 mm (3/16") nominal] or insulation and insulation overlay boards specifically designed for torch applications, must be attached with nails with a minimum 25 mm (1") nominal head size placed a minimum of one nail per 0.093 m² (1 sq. ft.) or plates and screws placed a minimum of 0.186 m² (2 sq. ft.). Seal all board joints and wall transitions with membrane manufacturer’s approved self-adhered membrane or tapes. NOTE: See more information on Low-slope Membranes Essential Elements. When specifying or installing a BUR system employing modified bitumen membranes, only factory cap sheets are to be used on slopes exceeding 1:24 (1/2" in 12"). Manufacturers published instructions as to application methods, materials, and slope limitations are to be followed. On slopes less than 1:24 (1/2" in 12"), double pour, modified double pour or alternate modified double pour and gravel surfacing may be used. The maximum slope for a graveled built-up roof is 1:5 (2-1/2" in 12"). Where roof slopes exceed 1:12 (1" in 12"), back-nail mopped sheet at 600 mm (2' 0") using large-headed roofing nails. On insulated roofs, install nailing strips to facilitate back-nailing. A double pour, modified double pour, or alternate modified double pour is to be applied on slopes up to 1:24 (1/2" in 12"). For slopes exceeding 1:24 (1/2" in 12") but not exceeding 1:5 (2-1/2" in 12"), use a single pour and gravel. A single pour and gravel surfacing is defined as a minimum of 3 kg / m² (60 lb / square) of asphalt and 20 kg / m² (400 lb / square) of suitable roofing gravel. A double pour and gravel is defined as a minimum of 3 kg / m² (60 lb / square) of asphalt in each pour coat and 20 kg / m² (400 lb / square) of gravel for each gravel application. A modified double pour and gravel is defined as 2 kg / m² (40 lb / square) of asphalt in the first pour followed by a 10 kg / m² (200 lb / square) gravel application, then a 3 kg / m² (60 lb / square) pour coat of asphalt followed by a 20 kg / m² (400 lb / square) second application of gravel. An alternate method of a modified double pour and gravel is defined as 2 kg / m² (40 lb / square) of asphalt flood coat followed by an additional 3 kg / m² (60 lb / square) pour coat of asphalt followed by a 25 kg / m² (500 lb / square) application of gravel. Granules are to be embedded prior to forming laps on all torch applied modified bituminous cap sheets. Membrane end lap corners must be cut on a bias (clipped or trimmed on an angle) prior to forming laps on all torch applied modified bituminous membrane roof systems. See Accepted BUR Membrane Components and Systems for RoofStar Guaranteed roof systems. See also Section 4 for special requirements concerning Membrane Roof Systems. For slopes up to 1:12 (1" in 12") use Type 2 asphalt. For slopes over 1:12 (1" in 12") but not exceeding 1:4 (3" in 12"), use minimum Type 3 asphalt. Use asphalt quantities of approximately 1 kg / m² (20 lb / square) for each mopping and approximately 3 kg / m² (60 lb / square) for the pour coat. It is essential that the asphalt temperature be no lower than 205°C (400°F) on the rooftop, and that maximum mopping distance from the roll not exceed 1 m (3'). A wave of liquid asphalt must be visible in front of the roll as it is being applied. For all applications other than protected membrane applications, the use of Type 3 asphalt is mandatory, unless the membrane manufacturer specifies a higher grade. For protected and modified protected membrane systems, use Type 2 or Type 3 asphalt for slopes up to 1:24 (1/2" in 12"). For slopes of 1:24 (1/2" in 12") to 1:4 (3" in 12"), use Type 3 asphalt only, unless the membrane manufacturer specifies a higher grade. Any variance to the above must be accepted by the owner or the owner's representative. .1 RoofStar-accepted self-adhered and cold adhesive applied membranes - install over wood surfaces to manufacturers' product installation specifications. Self-adhered membranes must not be installed on contaminated wood surfaces. A minimum 9.5 mm (3/8") nominal thick plywood sheeting (overlay) must be installed over all contaminated wood surface (eg. asphalt) to receive self-adhered membranes. Metal wall base flashing is optional with these application methods. A reverse lap application method for base sheet and base sheet flashing (stripping), at roof up stand transitions, is permitted when self-adhered base sheet flashing is used as flame protection for wood surfaces. Use of the reverse lap method must be an acceptable application method to the membrane manufacturer. The self-adhered base sheet must extend a minimum of 150 mm (6") onto the roof surface. The heat welded field membrane must be turned up at the vertical surface a minimum of 100 mm (4") or a heat welded base sheet transition gusset extending 100 mm (4") onto the roof and upstand surfaces be installed. .2 Mechanically Attached Base Sheet - Cover wood surfaces with a minimum 40-lb asphalt-coated fibreglass base sheet conforming to CAN / CSA – A123.16 – M88 (R1996), Type II or manufacturers' accepted base sheets of equal or greater weight and reinforcement. Attachment of base sheets shall be a minimum of one nail, with a minimum 25mm (1") nominal head size, per 0.093 m2 (1 sq. ft.), or one plate and screw per 0.186 m2 (2 sq. ft). Lap base sheet end laps minimum 150 mm (6"), mechanically fix laps at 100 mm (4") o/c and seal all corner details with membrane manufacturers’ approved self-adhered SBS membrane or tape. Wood surfaces must be “dry mop” dry, no pooling or standing water permitted. Metal base flashing is required on all vertical surfaces, walls, curbs, etc., that are 200 mm (8") or greater in height above the finished roof surface, when the mechanically attached base sheet method is used. .3 RoofStar-accepted asphalt core overlay boards (minimum thickness 4.5 mm (3/16") nominal) or insulation and insulation overlay boards specifically designed for torch applications - mechanically attach with nails with a minimum 25 mm (1") nominal head size placed a minimum of one nail per 0.093 m² (1 sq. ft.) or plates and screws placed a minimum of 0.186 m² (2 sq. ft.). Seal all board joints and wall transitions with membrane manufacturer’s approved self-adhered membrane or tapes. Alternatively a mechanically attached minimum 25-lb asphalt coated fibreglass base sheet conforming to CAN / CSA – A123.16 – M88 (R1996), Type II or 30-lb non-perforated felt conforming to CSA A123.3-M may be used prior to installing asphalt core overlay boards on wood decks. Metal wall base flashing is optional with these application methods. Wood surfaces must be “dry mop” dry, no pooling or standing water permitted. .4 Hot Asphalt Adhered - Install modified bituminous stripping (flashing) membranes to manufacturers’ installation specifications with conventional Type 3 or 4 oxidized asphalt or Type 3 or 4 SEBS modified asphalt. Metal base flashing is required on all vertical surfaces, walls, curbs, etc. when hot asphalt is used to adhere stripping (flashing) membranes. All felt roofs should be gravelled-off by the end of each working day. All installed organic, glass, or polyester felt roofing over which surfacing has not been completed must be protected with a glaze coat of bitumen, regardless of the season. In cold weather regions, membrane selection must conform to the membrane manufacturer’s recommendations for January in service design temperature. Membranes used for a single ply modified bituminous membrane system adhered or mechanically fastened shall be a minimum thickness of 3.5 mm on the selvage edge, with a minimum 150 g / meters squared polyester or equal strength polyester-fibreglass combination reinforcement. Torch applied membrane applications require a deck separation sheet of a minimum 40-lb asphalt coated glass base sheet or torchable overlay board. Direct torch application to wood surfaces is not permitted. A minimum slope 1:15 (¾" in 12") is required. Any roof areas less than 1:15 (¾" in 12") require 2 ply membrane assemblies.At roof slope transitions locations where slopes of less than 1:15 (¾" in 12") meet steeper slopes a two ply membrane assembly must be carried 900 mm (36") beyond the lower sloped roof transition point. Membrane gussets must be installed to all inside and outside corners. Modified Bituminous Base Sheet pre-stripping ply required at all perimeters, upstands and penetrations. Direct torch application to wood surfaces is not permitted. Cap sheet stripping is required and must extend 150 mm (6") horizontally and 200 mm (8") vertically from the base of all upstands. All stripping terminating on vertical surfaces must be mechanically fastened. Cover wood surfaces with a minimum 40-lb asphalt coated fibreglass base sheet conforming to CAN / CSA – A123.16 – M88 (R1996), Type II or manufacturers’ accepted base sheets of equal or greater weight and reinforcement. Attachment of base sheets shall be a minimum of one nail, with a minimum 25mm (1") nominal head size, per 0.093 m2 (1 sq. ft.), or one plate and screw per 0.186 m2 (2 sq. ft). Lap base sheet end laps minimum 150 mm (6"), mechanically fix laps at 100 mm (4") o/c and seal all corner details with membrane manufacturers’ approved self adhered SBS membrane or tape. Wood surfaces must be “dry mop” dry, no pooling or standing water permitted. Metal base flashing is required on all vertical surfaces, walls, curbs, etc., that are 200 mm (8") or greater in height above the finished roof surface, when the mechanically attached base sheet method is used. RoofStar-accepted self-adhered membranes must be installed over wood surfaces to manufacturers’ product installation specifications. Self-adhered membranes must not be installed on contaminated wood surfaces. A minimum 9.5 mm (⅜") nominal thick plywood sheeting (overlay) must be installed over all contaminated wood surface (eg. asphalt) to receive self-adhered membranes. Metal wall base flashing is optional with these application methods. Self-adhesive membranes must only be installed when ambient temperature meets or exceeds the manufacturer’s printed product installation temperatures. All self-adhesive field membranes must be fully rolled with a manufacturer’s accepted roller that is a minimum 34.2 kg (75 lbs.) or greater and provides an evenly dispersed weight. All flashing (stripping) membrane must be hand rolled with a membrane manufacturer’s accepted roller. The RoofStar Guarantee Program accepts cold adhesive applied membranes installed over wood surfaces to manufacturers’ product installation specifications. Flood Testing is not a recommended practice but is at the discretion of the design authority or owner on systems permitted by ASTM D5957. If flood testing is required, testing shall be conducted prior to installation of overlying insulation or overburdens and conducted as per ASTM D5957. NOTE: See more information on Protected and Modified Protected Roof Systems in Section B: Essential Elements. In a Protected Membrane Roof assembly (PMR) the membrane functions solely as the waterproofing agent (the requirement for a vapour retarder is eliminated) and the properties of the insulation become more critical. Extruded expanded polystyrene (conforming to CAN / CGSB-51.20-M87, Type 4) is the only commercially produced roof insulation suitable for a PMR, providing properties such as water resistance (i.e. resistance to water absorption, moisture transfer, and capillary action), resistance to freeze-thaw cycling, and high compressive strength. A Modified Protected Membrane Roof (MPMR) assembly is similar to a PMR except that a layer of insulation is installed underneath the membrane as well as overtop. This may offer cost savings as only the top layer of insulation requires ballast and the bottom layer (mechanically-fastened or adhered) need not be extruded expanded polystyrene and may be tapered to provide slope. The membrane must be located such that the dew point temperature (for the inside air) occurs above the membrane. As a general rule, two-thirds or more of the total thermal resistance (RSI or R value) should be above the membrane, but in all cases the design authority should perform the required psychrometric calculations before designing a roof system. Pour coat on all protected built-up roof membranes is to be 3 kg / meter squared (60 lb / square). Protected or modified protected roofs are to be constructed with non-organic membranes only. The membrane will withstand the National Building Code calculated pressure if it is properly attached to the deck. In the case of a loose applied membrane it is important to prevent any air infiltration underneath the membrane. Indeed, when air infiltration is restricted, any movement of the membrane will create a vacuum which will neutralize the uplift forces and keep the membrane on the deck. SBS Modified Bituminous membranes used on Landscaped and Vegetated conventionally insulated roofing systems with an overburden 150 mm (6”) or less in depth shall consist of two plies and the top ply (cap) must be a minimum thickness of 3.7 mm on the selvedge edge, with a minimum 180g / meters squared polyester or equal strength combination reinforcement. Thermoset and Thermo Plastic (EPDM, TPO, PVC) single ply membranes used for Landscaped and Vegetated roofing systems shall be fully adhered and a minimum thickness of 1.5mm (0.060"). Only RoofStar-accepted SBS Modified Bituminous, Thermoset and Thermoplastic roofing membranes that are specifically accepted by the membrane manufacturer for use on Landscaped and Vegetated (green) roof systems qualify for coverage under the RoofStar Guarantee Program. The Membrane Manufacturer and RoofStar Guarantee Program must confirm acceptance of other alternative protection systems or components in writing. Damage to membranes and flashings that results from the use of plants with aggressive root structures, (Bamboo, Willow etc.) for landscaped and green (vegetated) roof systems, is not the responsibility of the RoofStar Guarantee Program and is specifically not covered under the RoofStar Guarantee. For additional information refer to the latest addition of the British Columbia Landscape Standard, Green Roof Section. Where Extensive Vegetative Roof Assemblies are installed as part of the roofing specification and / or contract (Extensive Vegetative Roof Assemblies are defined as roof top gardens having minimal plant species diversity, irrigated only to establish plants, and typically having a soil depth of less than 150 mm or 6 inches) the costs for removal and replacement of soil to access the membrane, to investigate or repair leaks in the membrane, are included in the RoofStar Guarantee coverage. However, the removal and replacement of plants, irrigation lines and or equipment, electrical lines, landscape and decorative features such as concrete pads, statues, planters, large rocks, etc., to investigate or repair leaks in the membrane, is not included, and is the responsibility of others. Subsequently, such access shall be provided and/or paid for by others. Where Intensive Vegetative Roof Assemblies are installed as part of the roofing specification and/or contract (Intensive Vegetative Roof Assemblies are defined as roof top gardens with diverse plant species, irrigated for maintenance and typically having a soil depth equal to or more than 150 mm or 6 inches), and where the soil thickness of Intensive Vegetative Roof Assemblies exceeds 200 mm (8″), the removal and replacement of soil and plants to access the membrane to investigate or repair leaks in the membrane is the responsibility of others, and such access shall be paid by others. In addition, the removal and replacement of plants, irrigation lines or equipment, electrical lines, landscape and decorative features such as concrete pads, statues, planters, large rocks, etc., to investigate or repair leaks in the membrane is also the responsibility of others, and such access shall be provided and or paid for by others. Waterproofing liners in planters with structural walls, concrete curb or other materials, that do not incorporate pre-curbs shall be isolated and separated from the guaranteed roofing membrane and are specifically not accepted under the RoofStar Guarantee. Conventionally insulated roof assemblies are required to have a minimum 12.5mm (1/2") adhered approved RoofStar-accepted gypsum overlay board, and insulation boards with a minimum compressive strength of 20 psi, under the roof membrane for extensive vegetated systems (less than 150 mm, 6" in depth). Intensive Vegetative Roof Assemblies in excess of 150 mm (6") or more in depth are not permitted over conventionally insulated roof systems. The use of a minimum 2 mm SBS modified bitumen granular cap sheet in lieu of roofing gravel, at least under the deck-walkway supporting members (sleepers), is required. The cap sheet must extend a minimum of 75 mm (3") on either side of the supporting member. Ensure that no roofing gravel enters the system in this area. This cap sheet may be used in lieu of gravel under the entire deck or walkway area. The use of organic felt (No. 90) cap sheet in this application is not acceptable. The cap sheet in a modified bituminous membrane system (BUR) is to be installed either in a full mopping of asphalt or torched to the pour coat. Sleepers must not obstruct drainage, and must be notched or made discontinuous to provide flow to drains. NOTE: The type and performance of any walkway material is specifically excluded from the RoofStar Guarantee, as is any detrimental effect the walkway materials may have on the roof system. See Accepted BUR Materials for RoofStar Guaranteed roof systems. All membrane flashing (stripping) terminating under a reglet must be sealed to the wall with a compatible mastic (see D1.7.9 Counter-flashings & Reglets (Deck - Wall Supported) et al). At curbed openings, a minimum of one ply of felt shall be carried to inside edge of curb. Curbed openings (HVAC, skylights, etc.) must be a minimum height of 200 mm (8") and have at least one ply of membrane flashing (stripping) carried to the inside edge of the curb, or up under the built-in counter-flashing of pre-manufactured metal curbs (i.e. roof scuttles or HVAC) (see Detail D1.7.22 Curbs & Sleepers (Basic Curb)). All cant edge and parapet wall details must have membrane flashing (stripping) that overlaps the exterior finish (i.e. wall cladding) by a minimum of 50 mm (2"). On high parapet walls, that are completely flashed with metal, where membrane flashing (stripping) is terminated part way up the wall the remainder of the parapet must be covered with a flashing underlay of a minimum 40 mils or 1 mm (.040") self-adhered modified bitumen membrane. 15-lb felt is not acceptable (see Detail D1.7.1 Assemblies (Insulated Conventional)). Where a parapet, cant or separation / expansion joint detail intersects with a higher wall; the membrane flashing (stripping) must be sealed by gussets (membrane saddles) that are formed to protect the inside and outside corners (see D1.7.6 Parapets & Copings (Parapet - Wall Transition)). A reverse lap application method for base sheet and base sheet flashing (stripping), at roof up stand transitions, is permitted when self-adhered base sheet flashing is used as flame protection for wood surfaces. Use of the reverse lap method must be an acceptable application method to the membrane manufacturer. All walls requiring flashing, either bituminous or metal, shall have cant strips installed prior to the commencement of the application of the bituminous roofing membrane. At walls, minimum cant height shall be nominal 75 mm (3"). At roof eaves, minimum cant height shall be nominal 100 mm (4"). Wood: Cant strips are only required as recommended by the membrane manufacturer. The use of hemlock lumber for construction of cant strips and related blocking is not acceptable. Wood blocking, well fastened to deck, must be provided under wood cant strips to compensate for insulation thickness on conventional roofs and for the thickness of the under-membrane insulation on modified protected membrane roofs. Alternatively, cant strips may be installed over insulation and solidly attached to the parapet wall. Fibre Cants: Only fibre cants manufactured from non-combustible materials i.e. : perlitic or fire-resistant fibreboard are acceptable for use on roof systems with torch applied membranes. When fibreboard cant strip is used, wood blocking of equal thickness to the insulation is not necessary unless detailed by specifying authority, or unless required to maintain the structural integrity of the building detail. The use of hemlock lumber for construction of cant strips and related blocking is not acceptable. The self-adhered base sheet must extend a minimum of 150 mm (6") onto the roof surface. The heat welded field membrane must be turned up at the vertical surface a minimum of 100 mm (4") or a heat welded base sheet transition gusset extending 100 mm (4") onto the roof and upstand surfaces be installed. Modified Bituminous Base Sheet pre-stripping ply required at all perimeters, upstands and penetrations. Cap sheet stripping is required and must extend 150 mm (6") horizontally and 200 mm (8") vertically from the base of all upstands. When a built in membrane gutter joins an RoofStar guaranteed sloped roof; the gutter will be included by the Guarantee. Built-in membrane gutters that drain a roof not covered by a RoofStar Guarantee are not eligible for a Guarantee. Flanges - All roof flanges in contact with asphaltic membranes of any type shall be primed both sides with membrane manufacturers approved primer and embedded in a trowel coating of compatible mastic. Flanges are to be a minimum of 100 mm (4") wide. Lead flanges in contact with asphaltic membranes of any type shall be embedded in a trowel coating of compatible plastic cement. Priming is not required. All roof protrusion and penetration flashings, vents, curbs, sleepers, pipes cable, drains, etc. shall NOT be installed LESS than 200mm (8") from the base of walls, cants, eaves and other roof equipment, protrusion and penetration flashings. The exceptions are overflow drains and roof scuppers that are installed through walls. These items are to be located by others. With the exception of one on-site formed double standing seam corner joint and adjoining lapped flange joint, all flange corners shall be closed and soldered. Use only membrane manufacturer’s approved proprietary urethane based structural sealants to fill gum pans or pitch pockets. Install a back-up storm collar whenever practical (see detail Section 10.3. - new reference needed). This detail should be avoided; only use gum pans or pitch pockets as a last resort when other methods are impractical. Refer above to 10.3.2 Liquid Membranes for RoofStar Guarantee Standards and Guiding Principles governing the application of reinforced and non-reinforced liquid membrane flashing. The use of lead jack flashings is not permitted for use on torch applied membrane roofs. All purpose-made multiple penetration flashings must provide a positive weather seal by use of manufacturer’s proprietary rubber based friction seals, mechanical clamps or gooseneck type design, and be a minimum height of 200 mm (8") above finished roof surfaces. Gravel stop-type flashings may be used, provided manufacturer's printed instructions are followed.The exceptions are overflow drains and roof scuppers that are installed through walls. These items are to be located by others. Maximum heights of gravel stops shall be 25 mm (1"); and shall have a flange width of at least 100 mm (4") on the deck. Flanges shall be primed both sides with asphalt primer and embedded in a trowel coating of compatible mastic. Fasten flanges to solid wood blocking with regular roofing nails spaced at 102 mm (4") o/c in staggered fashion through the centre and along the edge of the flange. Membrane stripping plies shall be two overlapping plies of a minimum 2 mm reinforced SBS modified bitumen base sheet or two overlapping plies of a minimum 180 g / meter squared polyester felt. STAINLESS STEEL: 0.38 mm (0.014", 28 gauge) stainless steel, Type 302, 304, 316, 2B finish to ASTM A167-82. Maximum thickness tolerance variation ± 0.04 mm (0.0015") based on 1200 mm (48") wide sheet. COPPER: 0.56 mm (0.022", 16 oz.) copper sheet, cold rolled roofing copper to ASTM B370-81. Maximum thickness tolerance variation ± 0.09 mm (0.0035") based on 1200 mm (48") wide sheet. The use of concealed in-seam fasteners is required. Any fastening of metal flashings on the top of parapet surfaces is strongly discouraged and is not permitted as the only attachment method. If top-surface fastening must be used because of a specific job site condition, only appropriate screw-type fasteners with neoprene washers may be used. Nails are not acceptable. The top surface of walls (parapets, expansion joints, firewalls, roof dividers, etc.) wider than 100 mm (4" nominal) shall be constructed to provide positive slope to drain and be covered with metal cap flashing. Provide a reglet for all flashings terminating in concrete or masonry walls. When wall flashing terminates in a reglet, typically on high parapet walls, a coping flashing is required at the top of the parapet wall (see D1.7.4 Parapets & Copings (Low Parapet - Unsupported by Wall)). On new construction projects reglet and sloped wood blocking at top surface of concrete or masonry walls are to be installed by others. On flexible membrane conventional roofing systems, when metal wall or curb base flashings are not specified, both the RoofStar Guarantee Accepted Materials and manufacturer's approved wall or curb stripping membranes are acceptable when used with a secondary metal counter flashing placed a maximum of 250 mm (10") above the surface of the roof assembly. Stucco stops are not considered secondary metal counter flashings (see D1.7.11 Counter-flashings & Reglets (Stucco Wall: Re-roofing)). Gum edge or gum lip flashings should be avoided in all circumstances. If job conditions allow for no other alternative, written permission from the RoofStar Guarantee Program for use of gum edge flashing must be obtained (also called surface reglet) (see D1.7.13 Counter-flashings & Reglets (Double Surface Reglet)). On stucco-faced walls, only 2-piece flashings are permitted. The upper piece, retaining the stucco, must have a vertical flange to extend behind stucco and building paper. Stucco stops are not considered metal counter flashings (see D1.7.11 Counter-flashings & Reglets (Stucco Wall: Re-roofing)).